Is requiring someone to have a license to call themselves a certain type of professional–like a psychologist–a violation of freedom of speech? In this episode, we talk to Mary Louise Serafine, who made that argument in front of the Fifth Circuit, and won. In this episode of The First Five, lawyer and psychologist Mary Louise Serafine discusses her fight against the Texas state laws that forbade her from identifying herself as a psychologist because she didn’t have a Texas license. Mary Lou has a post-doctoral fellowship in psychology from Yale (where she also taught psychology), and for a number of years had a practice where she held group talk therapy sessions for people in mid-life going through divorces. Mary Lou herself takes issue with the concept of putting speech into different categories, and discusses how difficult it can be to determine whether something is “professional speech”–especially a profession like psychology, where there’s no universal definition of what the practice is (by some standards, running a Weight Watchers meeting or writing an advice column could qualify as “practicing psychology”). 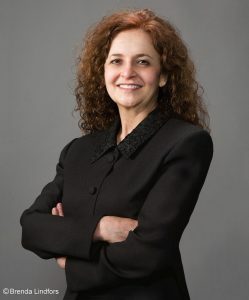 Lata Nott is the Executive Director of the First Amendment Center at the Newseum Institute. Mary Louise Serafine is a lawyer and psychologist based in Austin, Texas. To learn more about Mary Louise Serafine’s case, read the Fifth Circuit’s decision in Serafine v. Branaman. Not in the mood to read a legal opinion? Check out Mary Lou’s website, as well as Professor Eugene Volokh’s analysis of the opinion. Want to learn more about the distinctions between political, commercial, and professional speech? Check out the First Amendment Center’s overview of the subject. This entry was posted in First Amendment News, News and tagged First Five by Lata Nott. Bookmark the permalink.